From town to trail and back again, the Eva 24 is a girls mountain bike equally at home on the dirt and on the pavement. 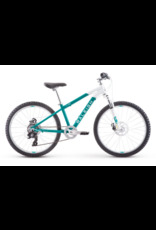 Its lightweight aluminum frame features a low standover height for easy on and off the bike. The cushy Junior Mountain bike seat and Junior Soft PVC grips add maximum comfort. With 7 gears to choose from and wide, multi-use tires, the Eva 24 will take kids into their next stages of adventure.